Google has long advocated that having strong high quality pages is much better for Google search than many lower quality pages. But in the quest to get more pages indexed in Google, some site owners are going for quantity over quality, and sometimes sacrificing the parts of the site that are high quality. For some site owners, they think the more pages Google has indexed, the more traffic they will get from Google, and the more keywords pages will rank for. Unfortunately, this is often not the case when put into practice, and it often doesn’t make sense to divide these pages into multiple ones from a user experience perspective as well. The question came up in the last Google Webmaster Office Hours with John Mueller. The context was a site that already had millions of pages, and the site owner then split each of those pages into four new ones. So I think there’s two things probably going on here. On the one hand it’s you’re splitting up one perhaps strong page and taking that and making four kind of smaller parts of that. Which on the one hand, that can work, but it also means we need to have the full context within each of the individual parts. So that might be something that might be playing a role there. 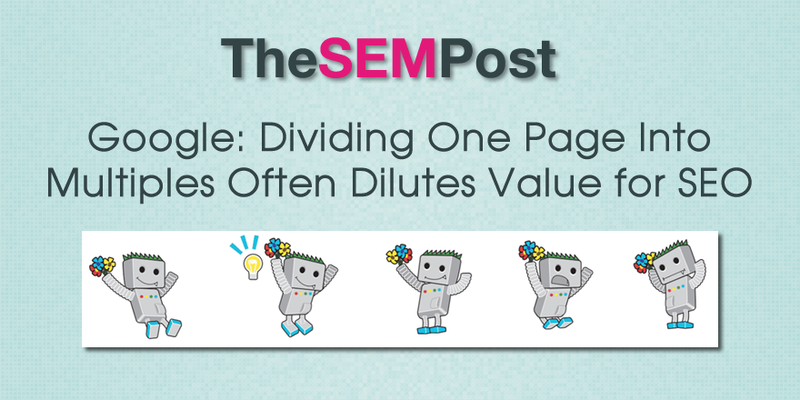 So if you are tempted to split a bunch of pages into multiple pages simply to increase your indexable pages count, you may want to rethink the strategy, as you could end up sacrificing traffic with the change.